Purpose: Develop and design the logo and website for Abbey Road On The River - A three day art, food and music festival honoring and celebrating The Beatles. Description: The site was developed in stages over the course of 2 months. 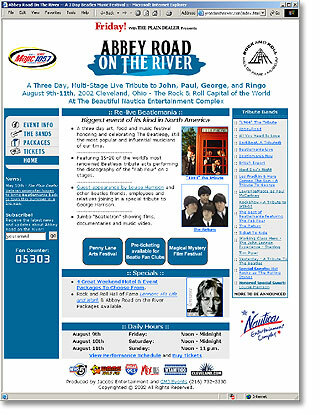 The first stage established AROTR brand and site structure with initial content to lure potential sponsors and performers. The second stage geared toward the event goers incorporated all event and performance info, including customized band pages, event info, ticket info, and weekend package info.